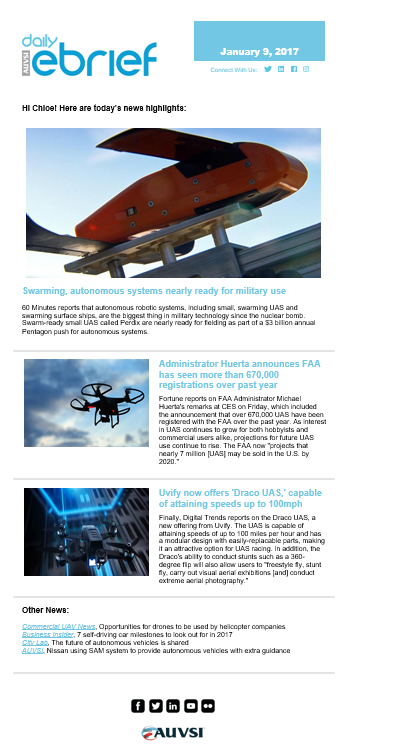 AUVSI’s Daily eBrief is a daily news blast for AUVSI members, providing critical intelligence on the unmanned systems and robotics industry. It’s a daily companion to our weekly eBrief, which goes to more than 45,000 readers. Stay informed on relevant updates that will keep you on top of industry trends and help you stay ahead of the curve. Become a member of AUVSI to start receiving the Daily eBrief. Click here to subscribe. Not a member? Click here to learn more about AUVSI membership. Want to get even more news? If you don’t already receive AUVSI’s weekly eBrief, click here to get started.